Enrolled trilobite: The trilobite's strategy of rolling itself up into a ball for protection dates back to some of its earliest known ancestors in the fossil record. This fossil trilobite (Isotelus?) was found in Late Ordovician shale in St. Paul, Minnesota.Courtesy Mark RyanA new study appearing in Biology Letters shows that trilobites - everyone's favorite prehistoric water bug - developed an effective survival strategy much earlier than previously thought. Trilobite fossils from Early Cambrian rock formations in the Canadian Rockies and elsewhere lend evidence that some of the earliest trilobites used enrollment (i.e rolling themselves up into a ball like an armadillo) to protect themselves from predators or the environment. 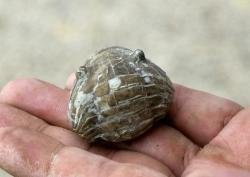 Trilobite fossils found here in Minnesota are several million years younger dating back to the Late Cambrian through Late Ordovician Periods (500 - 430 mya) and are often found enrolled. It was an effective survival strategy. Trilobites were arthropods, which meant they possessed exoskeletons, segmented bodies and jointed appendages. Their closest extant relative is the horseshoe crab. Trilobite bodies - for the most part - were comprised of a head (cephalon) positioned on a body (thorax) that was divided into three lobes: essentially an axial dividing a left and right pleura, and a tail (pygidium). The mouth (hypostome) was located on the underside. It's thought that most early trilobites were predators and/or scavengers who spent their lives roaming the sea floors looking carcasses, detritus or living prey to feed upon. Most trilobites possessed complex eyes (although some were eyeless). Like other arthropods (e.g. today's lobsters), trilobites would outgrow their exoskeletons, discarding them (molting) as they grew in size or changed shape. Their newly exposed soft skin soon hardened into a new, tough, outer casing. Once hardened, their segmented exoskeletons (composed of calcium carbonate) were ventrally flexible, giving them the ability to roll up into a ball should they need sudden protection from whatever threatened them. Some early trilobite forms from Middle Cambrian-aged fossils had been viewed as incapable of enrolling but the new research based on much older fossils found in mudstones in the Canadian Rockies in Jasper Park pushes back the origins of the strategy to some of the earliest trilobites to appear in the fossil record (Suborder Olenellus). These appeared 10-20 million years earlier at the very beginnings of the Cambrian Period and show evidence of having already developed the ability to enroll. Trilobites in some form or another existed across a span of more than 270 million years, a very successful run by any measure. The enrollment strategy certainly contributed to their longevity. Although trilobites were already in decline, the last of their kind were wiped out in the great extinction event that marked the end of the Permian Period and the start of the Triassic. They weren't the only casualty of the extinction: nearly 90 percent of Earth's species were terminated along with them. Even though trilobites are extinct (they died out in the Permian Mass Extinction along with around 90 percent of Earth's species) they were an extremely successful and adaptable life form. No wonder they remain today a favorite among fossil collectors.